In central Kuala Lumpur there is a sub- district called Chow Kit. This town was named after a municipal councilor who was also a tin miner. 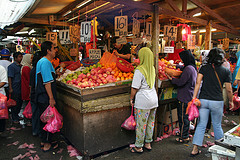 This sub-district has a shopping market known as the Chow Kit market. The district is mainly inhabited by Indonesians but Africans as well are slowly migrating into the city. 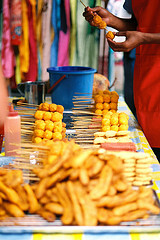 The chow kit market is located at the end of Jalan Tunku Abdul Rahman to the north. This shopping market can be accessed through a monorail on a daily basis. I find this shopping market in Kuala Lumpur very colorful. I believe that a meal of fish improves ones intellectual capabilities. I did not wake up one dull boring morning to come up with this bright idea, but it was passed down to me in the form of folk tales by my forefathers. Since then, I have taken to eating fish as if it were a religious duty. Whether or not I have become brighter can only be proved by my forefathers if they decide to wake up from their long term slumber. Back to my story. The fact that the Chow Kit market in Kuala Lumpur has a fish market makes me feel that I should have visited it yesterday. Since I did not, I am looking forward to the day I will sample some of the fish delicacies in this shopping market. I accomplish my short term dream by arriving at Chow Kit market in the mid morning. The pathways are narrow and they lead me to various stalls heaped with several kilos of fish. I pinch myself just to assure myself that I am at the right place. This shopping market is no different from the one I have always gone to. They too splash water on the fish to keep it fresh. Sometimes ice cubes are used to perform the same function. I would thus advise that you wear closed shoes with a good grip because the floor is normally wet. Without the right shoes, you might find yourself reporting down to the ground saying hello to your forefathers without their invitation. A variety of colors form the beauty that is the Chow Kit market in Kuala Lumpur. As I walk down the pathways I realize that no one is bothered to interrupt me with an item he/she wants to sell me. That makes my walks enjoyable, much to my satisfaction. Chow Kit market in Kuala Lumpur does not normally have tourists. Other than the food products on display, there is a variety of shoes and silk products that you can buy from the shopping market. Vendors at this shopping market are very kind. They will offer you a taste of the variety of fruits that they stock. They take pleasure at taking photographs with individuals who visit this shopping market. Tourists do not normally come to this market; that is why they take much pleasure in taking photographs with individuals. Chow Kit market is substantially covered by colored canvas. This protected me from direct sunlight making my shopping more enjoyable. However, there are spaces which are open to direct sunlight. They are not a major bother. 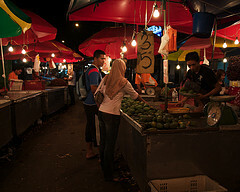 This shopping market offers a variety of edible fruits and vegetables. Other than that, it also stocks other edible foods such as fish which is my all time favorite, thanks to my brainy ancestors.